Tersteeg’s Meat Department continues to be known in the area for fresh cut quality meats. We believe we have the variety and quality our customers have come to expect. Our highly talented professional meat cutters are on duty 7 days a week to ensure freshness to our customers. We only offer the highest quality meats like Revier Cattle Company Premium Black Angus Beef and Hormel Natural Choice Pork. 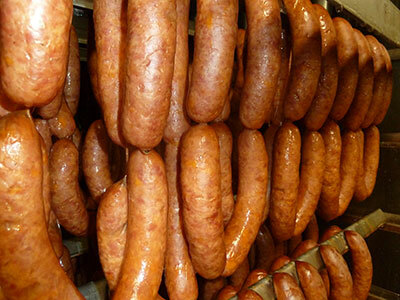 Tersteeg’s Smokehouse uses our own recipe to produce some of the finest smoked meats. We offer a large variety of different meats including 14 varieties of brats, smoked sausage, summer sausage, polish sausage, wieners, beef sticks, jerky and smoked turkey drumsticks. Everything is made in the store fresh! Stop in or give us a call for your special order and we will cut it exactly to your liking.